This piece of Belleek dinnerware features a lidded honey pot with hand painted shamrocks. 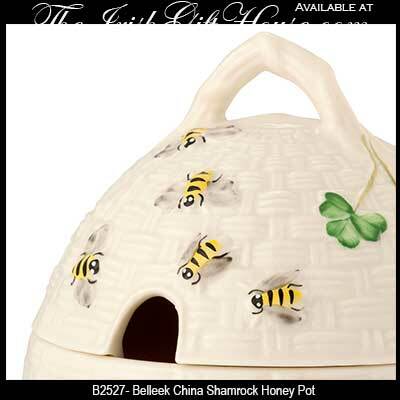 The Belleek honey pot was introduced in 2016. 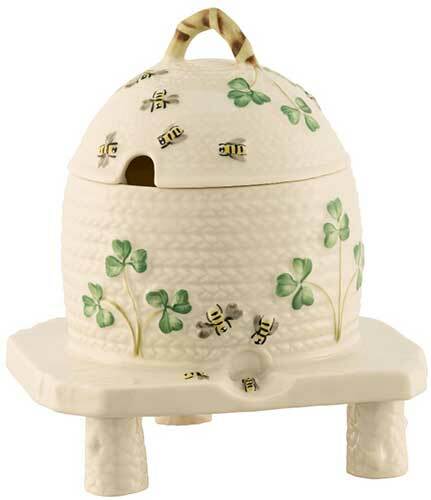 The Belleek honey pot features hand painted green shamrocks along with dimensional hand painted bees and measures 4" wide x 5" tall. The Belleek China honey pot hold 10 ounces is safe to use in the dishwasher and microwave along with the freezer and oven (to 375F). The fine china lidded honey pot is further enhanced with the basket weave motif.